New World Tourist is here! 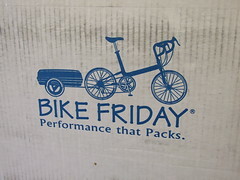 The bike came in a samsonite case, but I soon opened it to reveal it in all of it's glory. I soon had the bike partially assembled, I need to tweak things more carefully before I go out on a big ride, I'm trying to treat the bike well from the get go. After all, I do have big plans for it! (To be revealed after the event, that way I don't have a hostage to fortune. 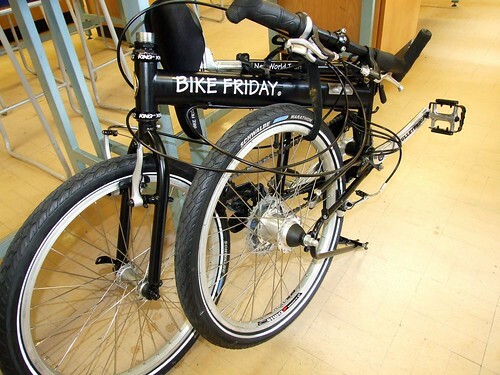 Here's the bike folded. 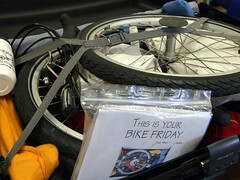 It doesn't fold as neatly as a brompton or similar, but that's not the purpose. The fold is a 'if you have to' thing - it's primarily a touring bike which can be disassembled for packing in a case for flights etc. I'm not sure I've folded it right - the velcro strap didn't have enough play to attach back on itself properly, and in the end I tied it to secure. Also the front wheel wobbled about a bit as it wasn't fastened. I'll have to look at this again. I'm quite pleased with it so far. 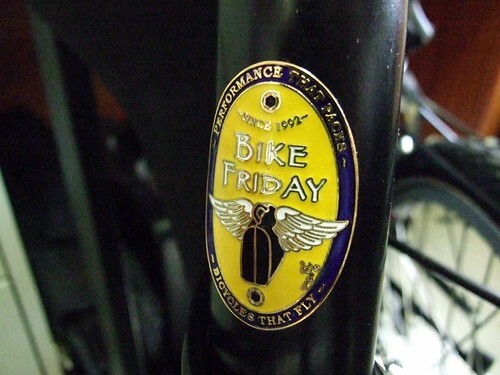 I showed it to a few work colleagues, one of whom is very knowledgeable about bikes, and disparaging about folders - he was impressed with the overall quality. 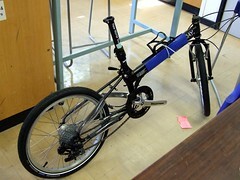 The hinge attaching the back wheel to the frame caused some interest as, in order that the rear wheel misses the frame when folded, it is at a slight angle. This looked odd at first sight, as if it hadn't been brazed on properly, but it was fine. The routing of the cabling for the rear brakes seems odd (the brake is very low on the wheel) - I'm a little concerned that it'll snag on the cranks - and there is a little tube which suggests that the rear brake cable should be routed above the bottom bracket - but that'd interfere with the fold. Also the shimano dual-drive only shifts between 2 and 3. I read the 'how to assemble manual carefully before getting short on time. 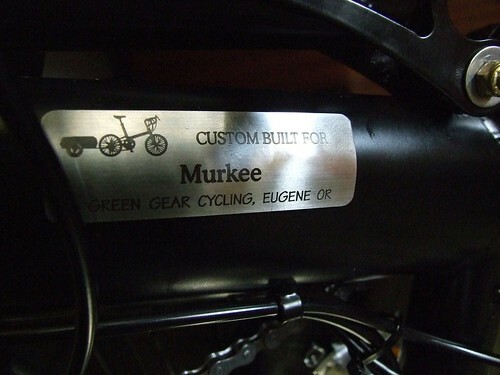 I'll have to read the other manuals more carefully before taking it out for a proper spin. I want to ensure it's set up right first - more haste, less speed and all that. I'm not concerned right now, I know I've more reading to do, and I hope the answers are in the books. Oh, and it's ninja black (or 'stealth' black - but I prefer thinking of it as 'ninja'). A followup post, in which I solve the hub gear issue, is here.